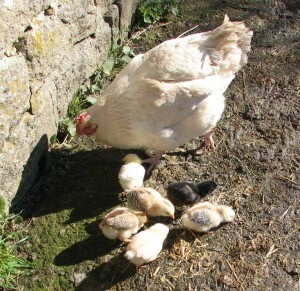 At least my chickens seem to think so having presented me with 14 tiny chicks this past week. 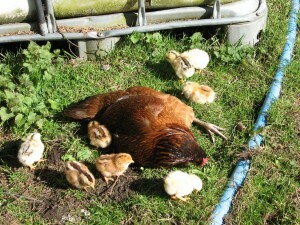 Matilda (on the right) hatched six and Mulan (seen here taking a well earned rest) hatched eight. I have spent far too much time watching them today when I should have been sewing. 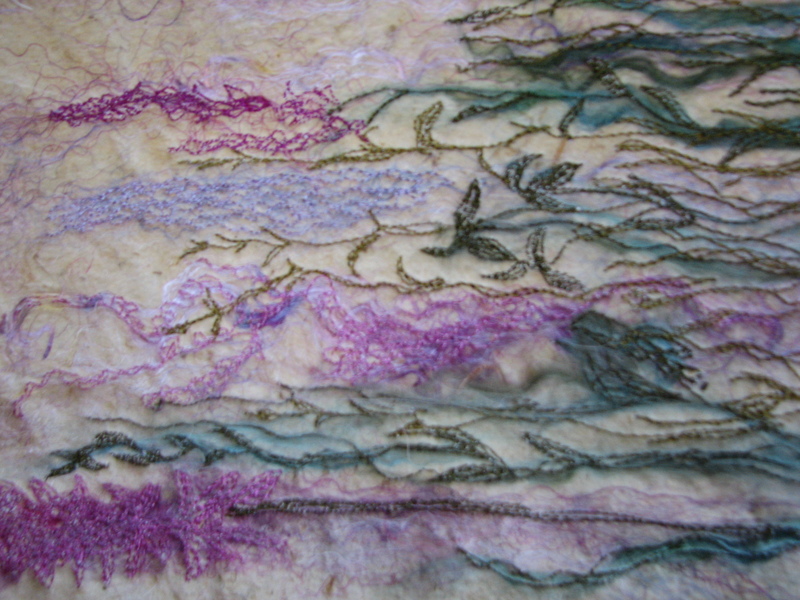 I have, however, managed to put information about the new workshops I am running up on the website and you can find the information about them here. A Sense of Place is the title of my July Exhibition. 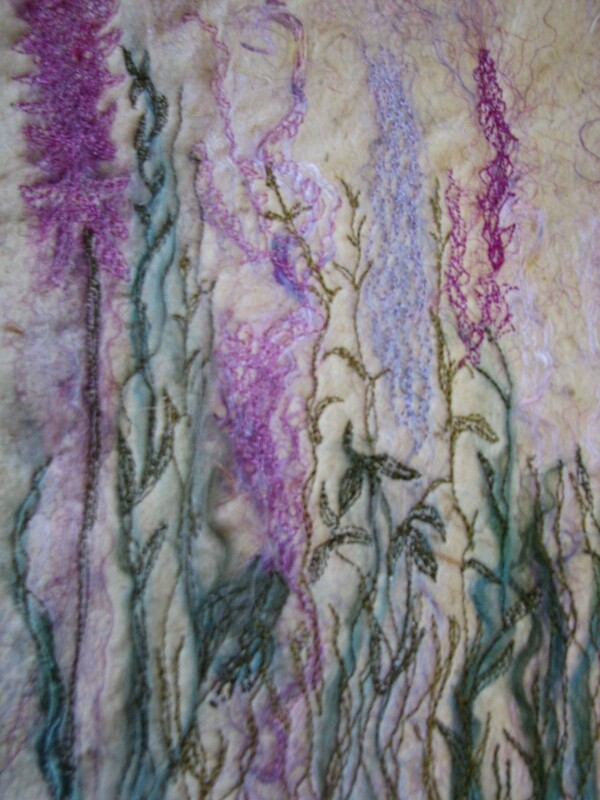 It will be at Allendale Forge Studios, Allendale from 1st to 31st July and will feature embroideries, art quilts and mixed media textiles inspired by my connection to the natural landscape. I hope the images will connect with you too as that is the joy of creating – the response your work hopefully engenders in the observer. The Gallery will be open from 9 – 5 p.m. each day. Saturday 7th July is the first Saturday event to which you are cordially invited but if you can’t make that day I will be in the gallery each Sunday (and on other days when I can) and will hope to see you. 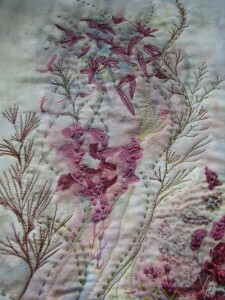 This is a detail of one of the embroideries now waiting to be framed. February has been an exciting month. Once Fabulous Fibres was up and running I had to get organised to move into Studio 11 at Allendale Forge Studios. 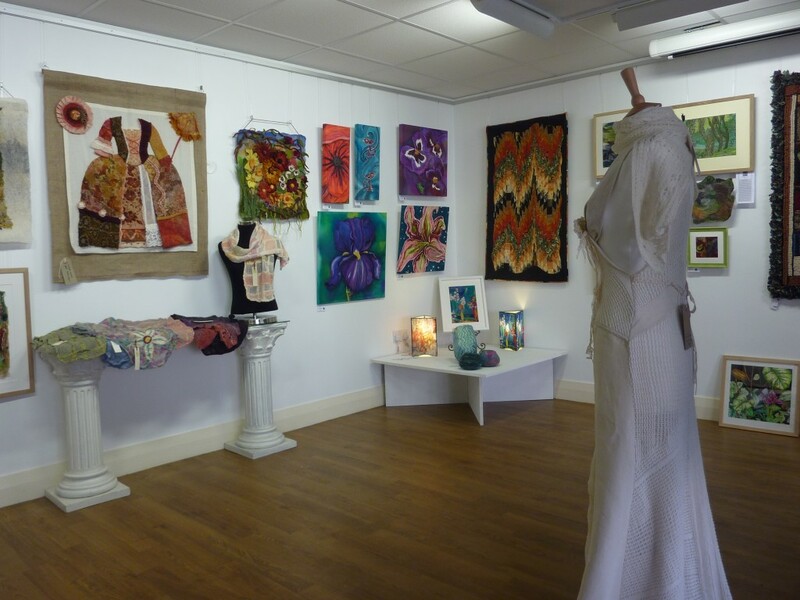 I am sharing this lovely, bright, studio which overlooks Allendale Square, with another local textile artist – Caroline Mann. As well as having a lovely space to work in I am able to offer Studio Workshops for up to two people and also sell larger pieces of work and kits which do not fit on my pitch in the Design Shop. We try to be open most days so pop in and see us. If you are making a special journey do contact me first to make sure one of us will be in the studio to welcome you.